Firstly as I'm new to the forum, I thought I'd say hi, so Hi. Been reading for a while but not posting. My question is, has anyone got any thoughts or experiences on Right Hand Jockey shift's , I've only ever had Left Hander's with the clutch on the shifter & I'm having trouble getting my head around the operation of a right hander, I suspect it may be more of a pain in the bum than the coolness factor is worth. Now I may be wrong but I dont think it would be hard to fab it would need some brackets and such and a cross over but thats not really a lot in the big picture. As for shifting if you can get used to it why not do it. I am with aus dog, I have done it on a 66 Tbird and just fabbed up a crossover bracket, which gives an added bonus to the cool factor of a jockey shift. A J.S. with homemade fabrication = extra cool. what is this "elek a trick start" you speak of??? I had a right hand jockey shift on a 72 TR6P....Never again. hill starts are a nightmare. The best combo I used was a hydraulic clutch conversion from PSP, operated via the left foot, (Right foot operated hydraulic rear brake using harley juice hub). I had a line locker fitted to the shifter so I could engage the clutch, lock it, then put my foot down. Took a little bit of getting used to but soon became second nature. Quite possibly, every *#@** thing is illegal here. Apparently side mounted number plates are as well. I had a 1942 WLA with a jockey shift which was able to be registered and of course they were tank mounted shifter, not jockey shift. I can easily put the foot change on and hand clutch in a day to get it registered, or maybe just cross the border into NSW, but then i would need proof of address. Anyways, never did worry too much about such mundane things as laws. ok I give up, i had the picture and now it's gone again. Last edited by Diggerdigzit on Mon Jul 20, 2009 10:02 pm, edited 1 time in total. I'm still scratching my head, but as an experiment I tried taking my right hand off the bars every time I shift (its not for me, even if I put a hand clutch on the shifter) as Chucky said, hill starts are a nightmare. I love the PSP clutch conversion (got one on my T140) but hydraulic's are a bit high tech for the bare as bones style I want. 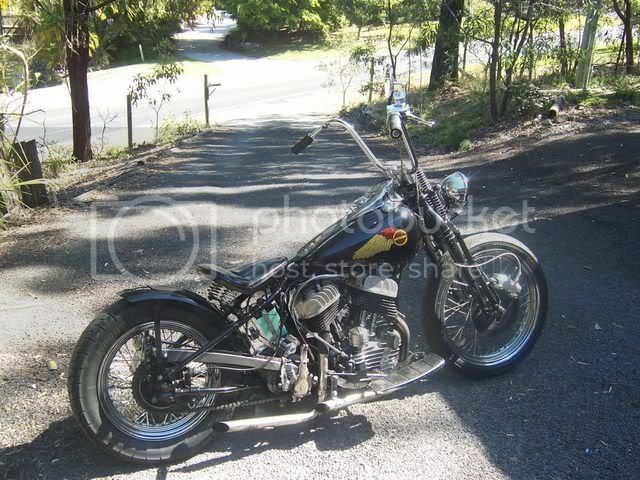 So I'm back in the planning stage, which involves sitting in the shed lookin at a couple of old Hurst shifters and the bonnet cable off my old XB falcon and tryin to work out the best way to right hand shift this bike without the clutter of linkages. practice makes perfect , they say. But if you really dont want it, thats the cool thing about motorbikes, like a swish suit - you make them to fit. Just an update on this in case anyone is thinking of a right hand shift in the future. With the rear brake sorted, the engine in a reasonable state of tune & the clutch still on the L/H bar, the R/H hand shift works pretty good, I can even manage a passable hill start. Dad used to show off on his u model HD (1200) and sidecar which had the left hand change and left foot clutch (not a suicide) same as the WLA. He would accelerate, clutch in, throttle off and swing his right hand across to the left gear knob, bang her into the next gear and back across to hit the throttle. He was quite quick at it. Also used to show off and change gears with his foot! Always loved a challenge! Any new sidecar passenger (ie virtually every visitor!) suddenly found them selves up in the air as he cruised along a quite a respectable speed with the wheel off the ground! On sharp left handers he used to delight in raising the sidecar wheel over the foot path as he "cut the corner". Thats such a cool pic, I love it !